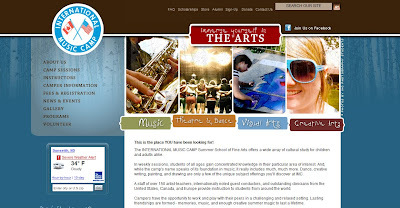 The latest web design, International Music Camp, located in the beautiful Peace Gardens on the North Dakota/Canadian border. This was one of my most favorite projects I have ever worked on. We were able to visit the camp, which so happens to be located in my most favorite neck of the woods, the Turtle Mountains. I posted about it before, but being able to soak in the atmosphere of that place really inspired me while designing their website. I wish I could do that more often. They were the best clients to work with and really respected my artistic integrity...of course, being a liberal arts camp, they understood the fact that web design can be an art in itself. Anyway, I was happy with the result and I hope they were, too. I believe it showcases what a great place International Music Camp really is!